Tagged bcp, large. Bookmark the permalink. Great summary of what it does without doing a copy/paste of BOL! I’m definitely adding this one to my weekly links list. Most of the times when explaining about BCP, everyone leaves out the option of executing a SP from BCP. Its not even mentioned as a demonstration also. May be you can add this if it is ok with you. HOW DO I ??? BCP out data from a table that has a text data type column. I want to replace the carraige return line feed ascii(char(10)) with a litteral . 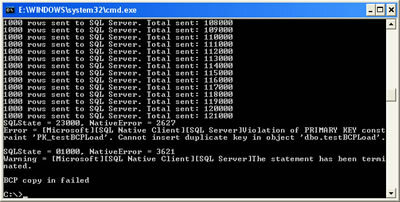 The purpose is to have a text file that I can use with SQL loader to load to an Oracle table. Then replace the with an ascii(char(10)). 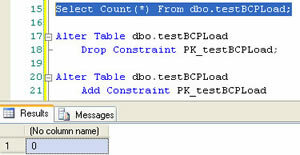 How to use -b parameter in bcp? with the BPC utility how I can add the name of the columns in the text file? Thanks Michelle, this helped heaps. MSDN was too complicated. I got what I wanted from your guide. Really good post and straight to the point. 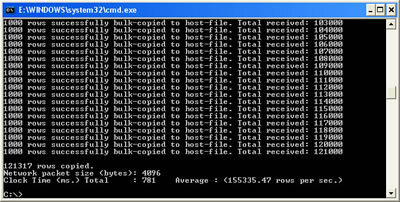 I was having errors trying to run BCP following other post but your worked first time. Thank you. Thanks so much for all your work…This is such a great site. Thanks Brent Ozar for sending me the link! Thanks a lot …. I have used some of the parts of your query and modify according to my requirement. Had a stored procedure that had 3 bcp commands… Full page of code. Wouldn’t work. Was debugging for two whole weeks problem after problem after problem. Found this article. Wrote 3 lines of code from knowledge gained from it in 10 seconds flat. Best BCP reference. Simple and concise. Thank you very much. Many thanks, easy sample to understand! Good work MICHELLE…. Nice post..
By the way, the CMD supports Copy & Paste, just not only by the Keyboard shortcuts. 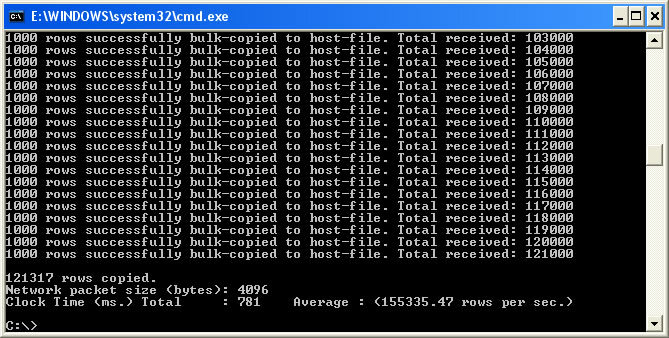 Try to copy something then right click on CMD console -> Paste. There you go! It will be better if field terminators are also mentioned in the article. I need to use a space character instead of the default tab. I’m not sure if this is possible. Just what I was looking for. 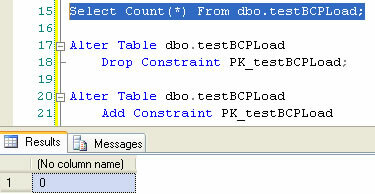 I’ve not used BCP before, I have to transfer some data from one Sql Server to another and have limited permissions. I didn’t know if I have permissions for BCP on the remote server SO… I tried a simple export (out) of a very small table according to these instructions. Voila, it worked. Then I tried the reverse, again according to these instructions, and it worked too. I believe I can use BCP for this task. Really nice, concise article on BCP basics. Thanks for this Michelle! Keep up the good work! 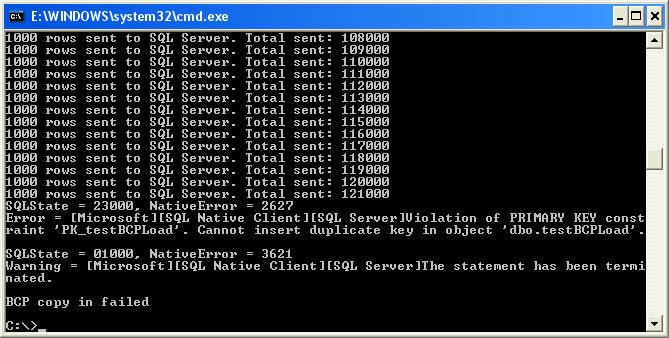 bcp output to a log file does not send correct exit code. when u run “bcp in” through command prompt, exit code is 2 (could not open a file) but when u pipe output to a log file, exit code is 0. Any idea how to get proper exit code? Thanks Brent.It’s very useful article. Can you please help in importing few columns from MS Access to Sql Server.Using the BCP. In addition to right clicking to paste, which can be undesirable because it also adds a newline at the end of the what’s in the clipboard buffer, paste is supported in the system from the System Menu. The system menu can be accessed by clicking on the icon on the left side of the windows title bar. For keyboard only users, that’s Alt + Space, E, P.
Hold down alt while tapping space, then release alt. Then tap E, the accelerator key for the Edit menu item. Then tap P, the accelerator key for the Paste menu command. On QUERYOUT to csv i am getting one space for NULL values. Please help me to find out the issue.. Thanks in advance..
Hi Michelle, did you ever do a second BCP blog post? I’m interested in getting error and/or logging output. 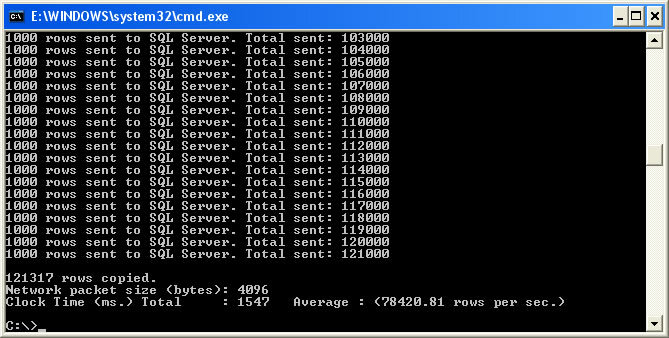 My current bcp command is populating the target table but zero output.